What Is Page Rank And How to Increase Page Rank For Blogs??? 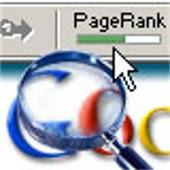 Page Rank is a Trade Mark Of Google Inc.( But Actually it is patented by Stanford University and the Google has its exclusive Licenese Right for the use over Internet's World Wide Web World.). PageRank is algorithm which is developed by Stanford Univerity and Co-founder of Google Larry Page To give a rank for every Seach Engine Results. PageRank Provides A Unique Ranking To every Page /Blog/Website over the Internet. This PageRank Algorithm is Based on the number and quality of inbound links pointing at a page amongst other factors. For More You Can Check PageRank At Wikipedia. First point to sucess in blogging is only and only Great articles. Try to Update your blog every day by adding more & more Unique Content. if you have good writing capcity and the Information you are providing is useful for your visitor than they will come again & again and 100% chance for the come back of visitors. When you start writing and you have a written a good amount of articles then start linking your our articles in new Articles. For example I am Writing a Article About Twitter and In previous Articles I have Written Some Information About the Same or Some Related Subject Then Give The link to that Article it Saves The Time of Our Visitor For finding Useful information And Also Make them to remain on our blog/website For More Time As How To Post your Flikr Photo's on Twitter And How To Start Poll On Twitter. Both Post Are Related To twitter. Create sitemap for your website (XML based for Google and text based for yahoo) then submit sitemap to Google and submit sitemap to Yahoo. Get a Google webmaster account and sign in there to see your website statistics. It will also tell you if you site is indexed or not, and your page rank in Google. Most Important Part of Increasing PageRank is Link Exchange With Other Web Owners of The same Content Of With others Who Are Interested To Link Exchange With you.This is for free and the very fast way to improve your visibility in search engines.Big Profile Sites Give out Link Exchange By Some Cost. Nice Tips. However to get High Rank is so difficult to me. You can check my Blog http://www.patromax.com. Dear Thanks For Commenting On My Blog I Think I you are older then me in the world of blogging. I Will Check your Blog If I Found That Can be Help Full For you Then I Will Try To Do For You. Page Rank is Google's method of ranking individual web pages. Google looks at the pages that link to your pages and how they rank in terms of importance, high quality pages, receive a higher PageRank. Google combines PageRank with sophisticated text-matching techniques to find pages, which are both important and relevant to your search. The Page rank system is a numerical grade from 0 to 10. You can increase your PR by commenting on other blogs and social bookmarking. You may also create fake profiles on social networks sites. Thanks for nice info!It seems that is much harder to get higher page rank these days then it was in the past.I remember my site 2 years ago which got page rank 3 just after 2 months.Today my newer site is still sitting at 0 after couple of months. Well, hopefully that will change soon. that way i can increase my page rank?